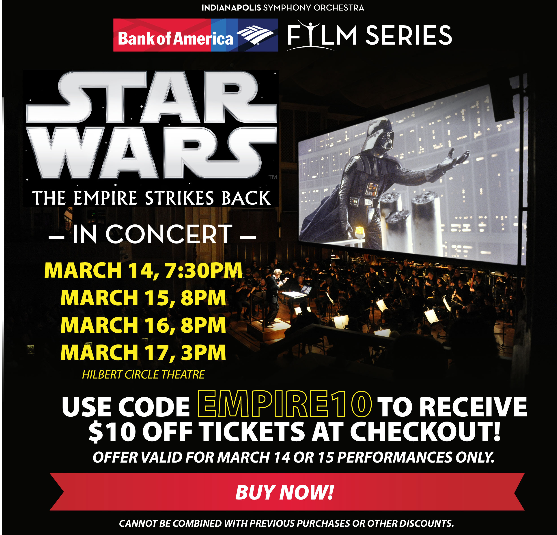 Those of you in or around the Indianapolis, IN area: You can get $10 off the ticket price for this SW:ESB-Live-to-Projection concert. One of our former members, Jetrell Fo, has acquired the CD-ROM Cinema DTS discs of all the Star Wars films, I-VI, and has shared them to the community. I’ve acquired them through via download from the usenet circuit in the form of an ISO disc image. Hi, friend, can you send me a PM to download these audio tracks for ESB Renegade Grindhouse v1? Among the things that Dreamaster has done to the “Grindhouse” print, he has GOUT-sync’d it, so, that you can mux the audio tracks from the ESB-Despecialized edition to the 35mm release print-scan with no out-of-sync issues. Could you pass me these castillian audio tracks to synchronize with return of the jedi 4k83? If you have the Despecialized edition of ROTJ, use the castillian audio tracks from that to mux with the 4K83. Why don’t you use the 1080p version of 4K83, which is out there, to burn to a blank Blu Ray disc instead of the using the full-4K version to downconvert to 1080p to burn to a blank Blu Ray disc? I still have that one ticket to give away—for free—and not one member has PM’d me. The thought occurred to me that members may feel uncomfortable PM’ing me their real names just to let me know that they’re interested in the ticket. How about this: Just PM me that you’re interested, but don’t give me your outside name. When I PM back to the first interested person, I will, then, ask for that person’s first and last name and e-mail address, as it appears in the person’s Ticketmaster account, so, that I can do the transfer of ownership. This way, I only have one person’s real name and not several. Those of you in or around the Indianapolis, IN area: You can get 20% off the ticket price for this SW:ANH-Live-to-Projection concert. There’s a few orchestra-center seats available for that night’s concert. I know it’s short notice but I’m giving away a ticket for Raiders of the Lost Ark: Live-to-Projection concert featuring the American Youth Symphony Orchestra, conducted by Carlos Izcaray, at the Royce Hall-UCLA. Los Angeles, CA for this Sunday, November 11, 2018 at 4pm. The “ticket” is a downloading PDF that you would have to print yourself. Ticketmaster handled the ticket sales on behalf of the AYSO. According to Ticketmaster’s policy, I would have to transfer the ownership of the ticket to a member with a Ticketmaster account. So, I would need to have the name and e-mail address of that member with the Ticketmaster account to do the transfer. If I’m successful at that, you’ll receive an e-mail notification from Ticketmaster that there’s a ticket for you and you would have to log-in to your Ticketmaster account to get it. At this time, please SEND ME A PM if you’re interested and I’ll respond to one of you. When you have your ticket, I can’t tell you what you can do with it, but I hope that you won’t resell it and, instead, just go to the concert and enjoy yourself. What’s significant about this album is that it contains portions of an alternative sound mix for a cut of the film that was shown during the film’s first few weeks of release that began in May 25, 1980. known here in the community as the 70mm cut, as that was the format that was presented during that period. It would have lines and alternative delivery of lines that would later be removed and replaced in a slightly extended cut of the film that began playing in theaters on June 18th, 1980. I would download this right row! Something tells me that it ain’t going to be up on YouTube for long. …and all in one day? Well, on July 29, some lucky folks in Tokyo, Japan can have that. Just thought I’d pop on to say I was at the special 3 films in 1 day Star Wars performance in Tokyo. As someone who has been a long time lover to be able to hear all 3 scores live for the first time in 1 day was a magnificent moment. But apart from that especiall the Cloud City part of ESB was spectacular. The Orchestra got a loud 5 minute standing ovation at the end for obvious reasons - 10 hours of performance in 1 day. Started 11am finished at 09:45pm at night. The tickets were 32,000 yen and sold out very quickly - they had a special credit card sized ticket - proper embossed like a store card which you put in to a lanyard to make it easy for readmission in the mad rush to get food. 20 minute breaks at the half way points of the film and 90 minute breaks between films. A recipe for sore posterior. Not something I was interested in but they were selling a special LP version of A New Hope - is that being sold in the west or Japan only? Saturday, September 1st, CBS-TV’s morning show, “CBS This Morning,” did a piece on Live-to-Projection concerts. Excerpts from the ESB Concert at the Hollywood Bowl are featured. I’ve not burned the DVDiso to a disc. However, when I opened it or, mount it, via the free third party software, Virtual CloneDrive, it created a faux BD drive exclusively for the ROTP disc, it immediately opened the file, and out on my screen popped the menu. Through the menu, I was able to select the videos (reel 1, reel 2, etc.) just by moving my cursor to the title I want and double-click it. Great job on the DVD. Can anyone confirm if nightstalkerpoet’s DTS-HD MA file of The Phantom Menace Cinema DTS Audio Track is in good sync with this release? The version that was shown at the concert is not the Special Edition 1997 version, but the 2011 edition that’s on the Blu Ray and streaming services. Regarding the second YouTube video that you provided, @abouttreefitty, as Luke is falling in the reactor shaft, Luke’s scream from the SE’97 is not heard at that concert. Also, when the Emperor, via hologram, is talking to Vader in his chambers, it’s Ian McDiarmid’s image that is seen at that concert and not the female-faced, monkey-eyed one from the ’97 version that is a carry-over from the ’80 version. Now, if only someone made a audio cap of any of the performances of Lord of the Rings:FOTR-Live concerts–from start to finish–and sync-it up to this release. The week of August 9th the unaltered cut of ESB is going to be shown at the Hollywood bowl with a full orchestra. I’m not there but I wonder if any of our “agents” on this site can manage to snag it. @LordZerome1080, I appreciate your post and the news. However, I am very skeptical about the “unaltered cut” part. I am sure that there are some fans, out there, that would love to not only hear this entire score live performed by a symphony orchestra, but also hear it accompanied by the GOUT-ESB. May I ask you to show us a link where this concert will screen the ‘unaltered’ version, please? Looks like the Casino Royale cut shown at the Wolf Trap concert, last Sunday, was the international cut. Here are a few images of shots exclusive in the international cut. The top is from the international cut Blu Ray, the bottom is that same frame, as seen in the concert. 'Sorry for the out of focus quality. At this time, the closet that Americans will get to have Casino Royale-Live is in Canada. Have any of you in the USA seen the international cut in a USA theater? Anyone, here, going to Wolf Trap-Vienna, VA for the Casino Royale (2006)-live to projection concert? This concert had played this year in Switzerland, Japan, and Poland were the audience saw the international cut that has 22 seconds of extra footage. 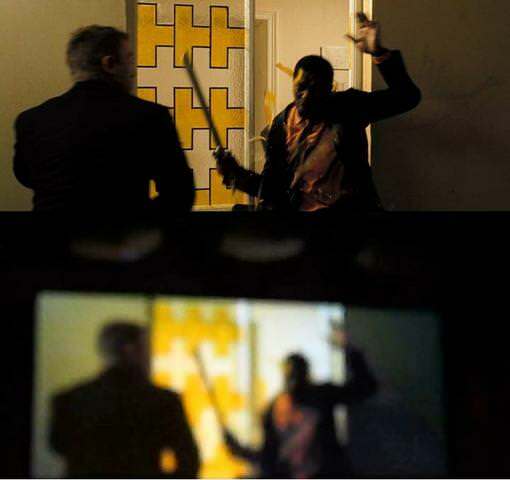 In those YouTube videos, there’s a shot during the bathroom fight scene where Bond bashes the bad guy with a full-length swivel door. That shot is not in the USA cut. That said fight and the stairwell fight scenes were trimmed for USA theaters to satisfy the MPAA–over 4 and 3/4th seconds and over 18 and a half seconds were removed for each scene, respectively. 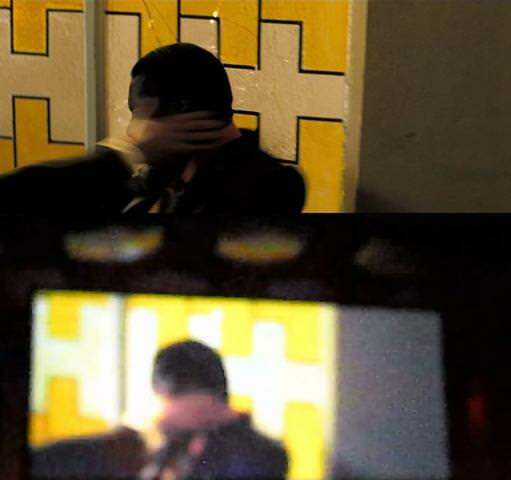 The music for these scenes were edited to fit the length of trimmed scenes. Wolf Trap is the first USA territory for Casino Roayle-Live concert. I am curious as to what cut they are going to play there, this Sunday–the USA cut or the extended International cut. If the USA cut is to be screened, the concert’s producers, Film Concerts Live, would have to do the work in transcribing the edited music of these said trimmed sequences on to the orchestral pages for the musicians to play, among other things to consider. Either way, this event will be interesting to witness. The shot during the “Luke Pull up” it looks like and this is the only way I can explain it, someone turn the brightness up high for that one shot. Why don’t you make a screenshot of the image you are talking about. Just press “PrntScr” on your keyboard for the image in question, save the photo, go to a photo-hosting website and upload the screenshot that you saved, copy the link of the screenshot from the photo-hosting website, and paste the link here. What is the music used in that preview, it sounds great.